My husband is a brave man. I announced tonight that I was "experimenting" with home made pizzas for dinner, and he showed up at the table despite seeing the random ingredients on the counter. We've been eager to use fresh garden goodies, but the veggies are just beginning to flower, so I made do with fresh basil and cilantro. 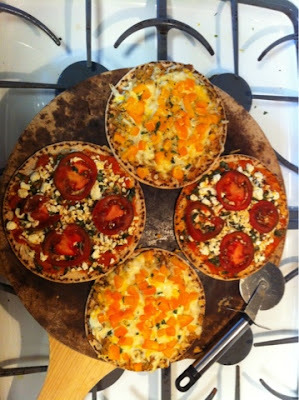 I played it safe with one pizza, topping it with marinara sauce, garlic, basil, feta, fresh-grated Parmesan and tomatoes. I got creative with the second one using what I could find in the fridge. Hello tofu crumble with peanut sauce, cilantro, onions, bell peppers and pepper jack cheese! It was my vegetarian spin on BBQ chicken pizza. Not bad, actually. The cilantro and peanut sauce went well together. All of the toppings sat on whole wheat Mediterranean flat bread, so the pizzas were healthy, filling and husband approved! There are chopped herbs and little piles of cheese all over my kitchen.